Happy premiered our official music video for Tunes Of "Kiss The Sky" filmed in Wellington and alternative dimensions courtesy of Don't Panic Pictures' green screen studio. What a blast! Stuff.co.nz covered Mark's exhibition of his Great Barrier Island limited edition prints being exhibited on Waiheke Island as part of a curated exhibition "Light Through the Night" at the Waiheke Community Art Gallery. The article's title is 'Rare collection of night sky photographs on show at Waiheke Island gallery'. Kapiti Mayor K Gurunathan was 'snared' by one of Mark's framed limited edition astrophotography photographs when he ventured out along the Kapiti Arts Trail 2017. Mayor Gurunathan wrote an article which went on to compare his reaction to the photograph of the blazing Kapiti Island stars to the words of Marienne De Blois: "It opens and closes with unfolding energy - it blooms and pulses and is very beautiful to watch." Mark had 8 images exhibited at Waikanae Beach's Tutere Gallery, two of them images captured along the Kapiti coastline. RNZ National Music put out the premiere of the official music video for The Nudge's "Dark Arts" - a video we collaborated, filmed and edited with this fantastic band. The Wireless premiered the video we helped film and edit with Jon Lemmon for his crowd sourced music video "When It Came Along". The Dominion Post + Stuff.co.nz showcased our 45second Newtown Festival video to promote the 20th Anniversary of this thriving community street party and festival. BIG THANKS to AFROPUNK who ranked our I SPY video for the wonderful whimsical Estère at #2 in their TOP 20 Music Videos of 2014. Massive congratulations to Estère who placed #2 for BEST SONG for I SPY, and #4 for TOP ALBUM of 2014 for her first self-titled album. AFROPUNK premiered Estère's "L'oiseau dans l'etoile" (Bird Up In The Stars) that we filmed and edited for the Aston Rd Sessions (live) in May 2014. Air New Zealand International featured a 30 minute compilation we produced for the Aston Rd Sessions (live) studio recordings of Louis Baker, Thomas Oliver and Estère. The showcase is part of their in-flight entertainment programme between December and February. AMPLIFIER NZ and Libel NZ showcased our music video for Trinity Roots "El Kaptain" in their 'Featured Videos' section. TheNext2Shine.com (for up-and-coming R&B talents) featured our Aston Rd Sessions (live) video of Louis Baker & band performing Louis' song "Get Back" on their Watch List. Further on in their e-article they also featured "Just Want to Thank You". AFROPUNK featured a fantastic article on Estère, Culture Clash + her "Electric Blue Witch Hop" which also show-cased I SPY, the music video we filmed with Estère and Lance Ravenswood. French record label PRØSPECT officially released Estère's first album online with a link to the video that we made in collaboration with her for her fantastic song I SPY. A superb debut album Estère, congrats! NZ MUSICIAN interviewed Warren Maxwell and featured the video we made for Trinity Roots' "Haiku". Stuff.co.nz released Louis Baker's Aston Road Sessions (live) cover of Prince's "Purple Rain" as the feature article on their entertainment section, 30/09/2014. The NEW ZEALAND HERALD premiered the music video for Trinity Roots - HAIKU, filmed + edited by The Renegade Peach Project, Aug 2014. RIP IT UP premiered Estère's I SPY music video, a video filmed + edited by Mark Russell and Sophi Reinholt (The Renegade Peach Project) and Lance Ravenswood. TV3 covered the release of our promotional video for NEWTOWN FESTIVAL 2015. AFROPUNK covered the release of our video of songstress Estère's ASTON ROAD Sessions release of her cover performance of PJ Harvey's The Words That Maketh Murder. Great work Estère! UNDERTHERADAR (UTR) premiered our video for Joe Blossom Tyger Tyger. GREENPEACE NZ got in touch to use one of our images taken at the LYALL BAY Banners On The Beaches Oil-Free NZ campaign as a mail-out image to supporters - reaching approximately 250,000 people. BACK TO FRONT - a project by Wellington photographer Dan Robinson of SOUL PHOTOGRAPHY turns the camera back on to photographers who usually wield them, photographing them and then interviewing them on their motivations behind the act of capturing moments. Our video for Estère's I SPY came in at #2. AFROPUNK premiered our video of Estère's final Aston Road Sessions (live) performance of "L'oiseau dans l'etoile"
Detail - Our video of Louis Baker's Aston Rd Sessions (live) "Get Back" featured on TheNext2Shine.com's Watch List. Estère feature in ASTROPUNK, also linking to our music video "I SPY"
NZ MUSICIAN featured an interview with Warren Maxwell which featured our video for Trinity Roots' "Haiku". Kapiti Mayor K Gurunathan's article about the Kapiti Coast Arts Trail, 2017. Title refers to Mark's astrophotography image of Kapiti Island. Stuff.co.nz covering Mark's exhibition of his astrophotography being exhibited on Waiheke Island. The Wireless premiered "When It Came Along"
Amplifier NZ featuring our video for Trinity Roots "El Kaptain". Our video of Louis Baker's Aston Rd Sessions (live) "Get Back" featured on TheNext2Shine.com's Watch List. 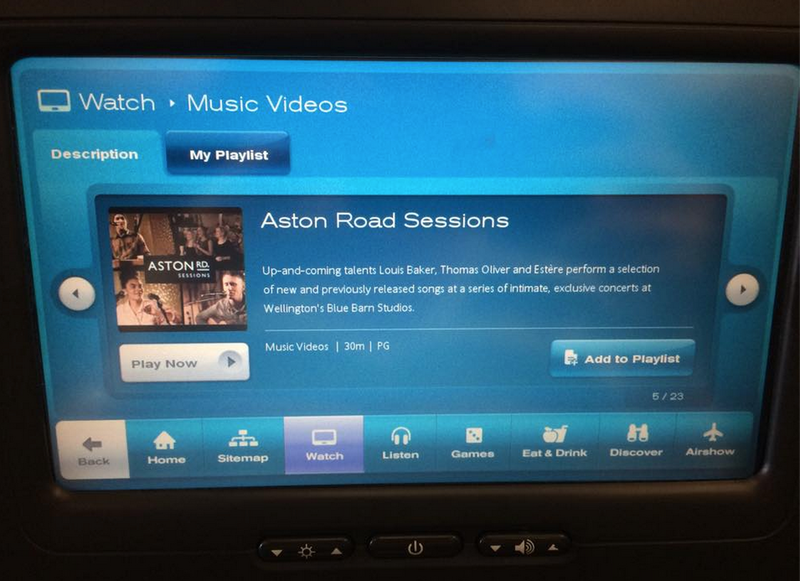 Air New Zealand International featured a 30min compilation of our Aston Rd Sessions (live) as part of their Dec-Feb '14/'15 programme. ABOVE Image of Sophi Reinholt by Dan Robinson of BACK TO FRONT. Happy premiered our official music video for Tunes Of I's "Kiss The Sky". RNZ National premiering our Official Music Video for The Nudge's single "Dark Arts". Libel NZ featuring our video for Trinity Roots "El Kaptain"
The Dominion Post online featuring our 45second promo video for Newtown Festival. French record label PRØSPECT debuted Estère's first self-titled album online with a link to the video I Spy. UTR Premiere of Joe Blossom - Tyger Tyger. Dir Mark Russell. AFROPUNK features Estère's cover of PJ Harvey's "The Words That Maketh Murder" for Aston Road Sessions (live). Superb work, and beautiful people. Mark and Sophie did a fantastic job on our Promo Video for the League of Live Illustrators. We were so lucky to have Mark + Sophi agree to film our special day. They managed to capture each moment, from the start to the very end, without us even realising they were filming. Mark + Sophi were easy to work with, and fun to have around for the day.